Video demo: Victor Vlasov. Improvisation and Steps. 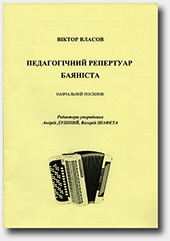 Performed by Volodymyr Kurylenko (bayan) and Vladimir Kirasirov (guitar). "Steps" starts from 2:05 min. and is for sale here on our site. by Hieronymus Bosch Victor Vlasov. and the Sea Wave V.Vlasov. 2) At the Evening Party V.Vlasov.